I often lose my head when I walk into amazing lighting store or see fab pendants online. Is just the ‘I want them all’ feeling! It’s so easy to fall in love with lamp and buy the wrong one! Sometimes we simply unaware, how the lighting actually can affect our mood, our productivity or simply gives us headaches! Also, lamp may look pretty in a store shelf and how the visual merchandiser styled it, but not practically looking good at your space. I have prepared a lighting guide, so before you buy your next lamp you can remember these few simple rules and improve your well-being, while creating a proper design statement. 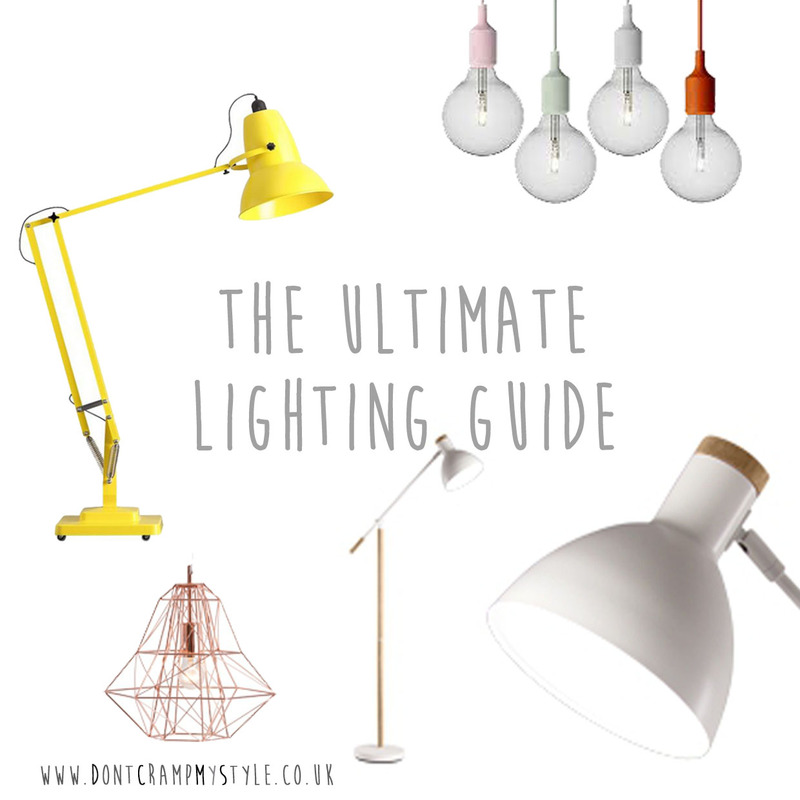 Don’t forget to check my light-bulb guide post as well. For every woman, kitchen is the main command centre. (Ok, guys like kitchen too..sometimes) Having the right amount of light here, will help you not only prepare yummy meals, but also it will inspire you to be more creative. Also, naturally we want kitchen to look stylish and cosy. This is the home ‘’heart’’, so as much as the furniture are important, that is the lighting too! 1. Create a statement above the dining table or island. Don’t just go for ‘’any’’ pendants. Look around your kitchen and furniture, cabinets especially. If you have fresh, modern cabinets with chrome handles don’t go for glass pendants- pick coloured, Scandinavian style. 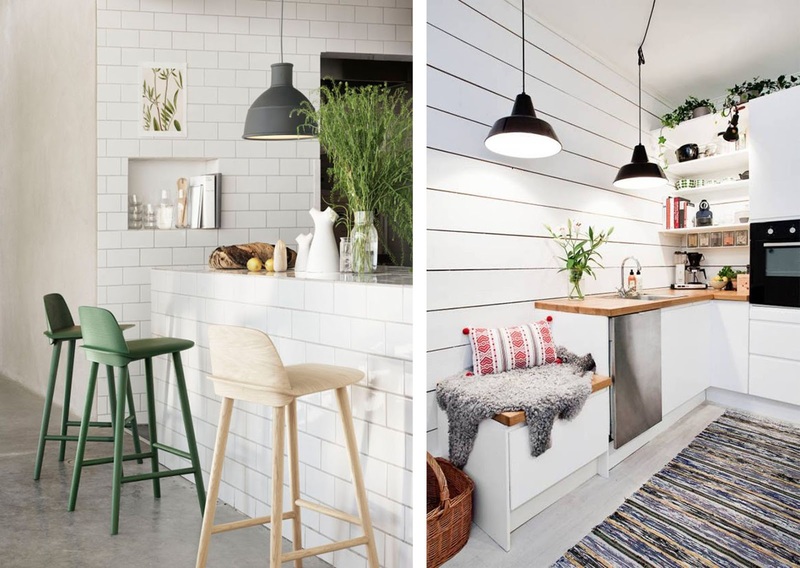 If you have retro, wood mix with colour or dark cabinets, try to choose pendants that have a wooden element with less pattern ( unless you specifically want to go for the retro style). I love industrial pendants in the kitchen, this style go nearly with every kitchen apart from late 80’s beginning 90’s typical cabinets with gloss round plastic handles (like the one I have! awful) For best prices and savings, check out stores like Next, BHS, habitat, johnlewis, made.com, urbanoutfitters, littlewoods etc. You are most likely to find there bargains and sales. 2. Main light. I think you can skip the main pendant here. Focus on good quality down lights. Chose white LED, that gives you enough light you need. Kitchen like any other room (apart from bathroom), is also one of the place that is more likely to get bacteria from food. You need bright and strong light bulbs to see properly when cleaning up. Up for a higher voltage light bulb. (here is light-bulb guide ). 3. There is popular ‘’trend’’ lately within kitchen designers to add LED strip colour lighting within the Splash-back area and also by the plinth. Just be careful when ordering these. Many kitchen designers will try to convince you to add them ( extra money for them- more tacky home for you). It can look absolutely awful, so be careful. Adding strip light to splash-back can help to keep low light during nights and can look good, as long as you will go for simple white light without making a nightclub of your kitchen. This is the place where we come to re-charge out batteries, read good book before sleep or just spend time on laptop ( like me). 2. 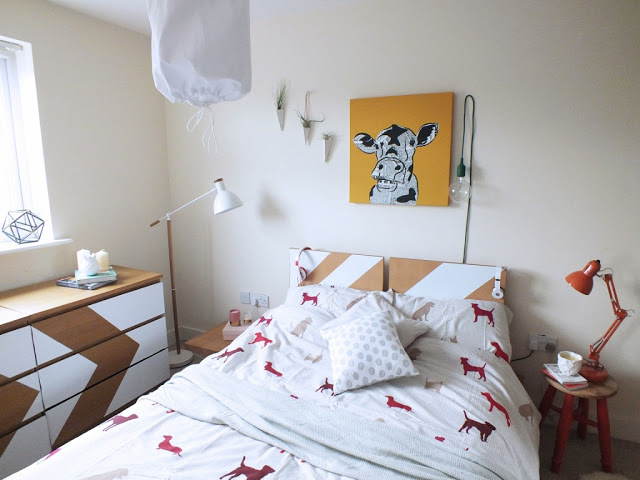 The colour of light bulb or pendant pattern, can also make the bedroom look different. If your bedroom is already cluttered, because you own so much staff, think rather of pendant without pattern or texture, as this will create design on its own. Textured or string (where light can flow through)-This can be absolutely beautiful and can create stunning ambience as well, if you keep your bedroom neat and tidy. Don’t forget about closet light if you lucky enough to have one. 3. The main light should be quite strong light. You will need this if you drop your glasses, lost your cat (like I do often) or you need to hoover 😉 With regards to the lost cat, my cat fur is same colour us my rug… easy to get confused without contact lenses. On a serious note, again consider a strong light bulb here as well. When choosing pendant- don’t go overboard. 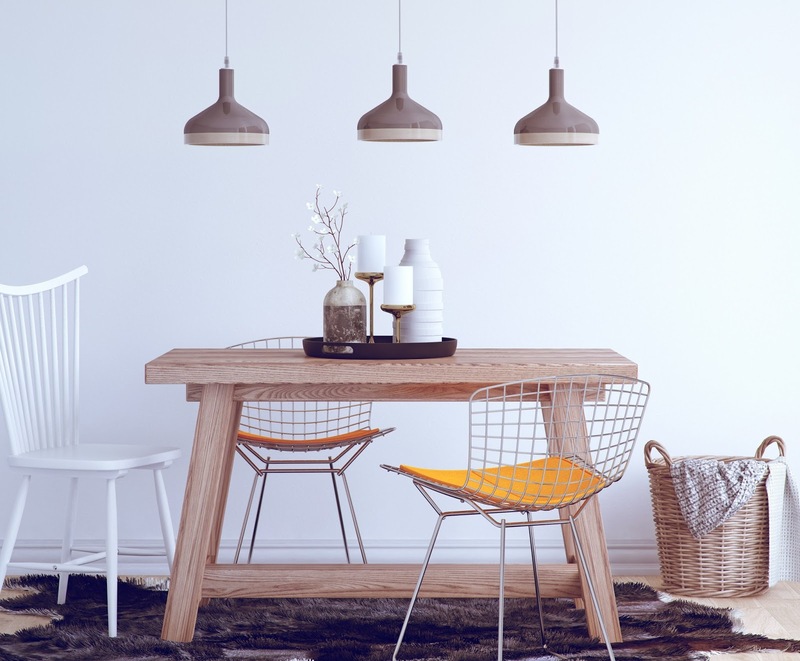 If you already have great ambience lighting you can go for simple geometric pendant or smooth fabric one. 1. Floor lamp, of course! My first advise, check out your sofa! I love fabric sofa’s with industrial lighting and leather sofa’s with fabric shade. Personally, I wouldn’t mix fabric sofa with fabric shade; too much similar texture. Also, check out the patterns of your cushions! Don’t mix 2 x large patterns next to each other! My favourite Polish blogger Jagoda, beautifully explained that. (I hope she will translate that in English one day) Especially, if you already have large pattern on your lampshade (either from pendant or floor lamp) and on your cushion, this would really crash! 2. Pendant lamp. Here, again check against your floor lamp- many people mix same shade on floor and pendant lamp. You are ok to do that, as long as they’re in fairly distance of each other. If big lamp shade of pendant, then smaller floor’s one etc. I personally love smaller side table lamp right opposite the floor one. I just love lighting! Make sure this one is a very simple but you can (and you rather should) add colour here as well. 1. First of all, you need to place your desk as close to daily light as possible. Consider keeping your desk a little in front of the window rather right next to it giving yourself an open space feeling. It will help your eyes! 2. Task lamp. Of course. Anglepoise are popular but also clip in to the desk or shelf are very practical too. I know some desk lights looks soo pretty.. but forget here about oversized side table lamp. You need a light that is flexible and not too strong. 3. Make sure you have another source of light nearby, either pendant light or spotlights. Be careful with textured shades that creates patterns on wall, it may look good but can easily distract you. Try to switch to one coloured fabric or just oversized bulb style second lamp here. 1. Here, focus on natural light as much as you can. Kids/ teenagers are growing and while studying or playing more important is the natural light! Try to place their study/ playing area as close to window as possible. Task lamp on child desk also is a must. Use lower voltage light here. As much as nice lighting, on stable base would look great consider flexible arm either angle poise or on clip attached to shelf. 2. Main light can be fun. Girls loves chandeliers, boys themed shades. Be creative, have fun- add colour! Be careful with heavy chandeliers and I would reconsider glass chandeliers and think to use cheaper plastic with no sharp ages. Kids play in the rooms and accident happen. 3. Consider small night lamp for small children. Best, if this would one with very low light not to wake up your child. You may consider LED light bulbs for the safety of your child. There are light bulbs available that won’t burn your child if accidentally touch it. Remember it can be too big and too far so child can reach them in case if a teddy fell or need to run to a bathroom. Skip the pretty oversized desk lamp, it may look good but completely un-practical here. 1. I just love wall lights next to mirrors! It will add real statement to your bathroom. Be careful when choosing non shaded lighting as close to water it just ask for a drama. Consider to hang them high enough then. 2. Good quality down lights will do the trick but avoid to place them too far as it will create ‘’shade’’ on your face and for girls like me who do make up in bathroom this can be a real nightmare. Consider mirror light then with nice clear white light. 5 reasons to buy Habitat rug to your rented apartment. Hello everyone! To choose qualitative led light is a big problem for me. I really do not know which band to choose…. I was thinking about this one hardware.eu/bega but it seems they produce only industrial lighting. Or am I wrong? Can you recommend me anything? Coincidentally I am looking for a nice bedside lamp and this has definitely helped! I love those black hanging lights in the kitchen! Super dreamy! Bedside lamps are one of my favorite, especially since my husband is a television watcher and I am a book reader. I love the look of industrial lighting. We have a similar pendant in our kitchen and it's perfect! Lighting is so important, it completely changes the look and mood of a room. Great guide. Some wonderful lights. I do like a good like, the more unusual the better. Our latest addition (for the lounge) just arrived today. Very exciting. But have now discovered the bulbs will cost the same price as the fitting. Oops. Lighting can make such a difference to a room. The bathroom is gorgeous, I do think lighting in the bathroom has to be bright, but adjustable so you can have a relaxing bath too. Great lamp decor ideas. Bookmarking this post for when we redecorate.